The Ministry of the Environment is responsible for administrative and research tasks in the areas of environmental protection and planning, and has over 2,500 employees. 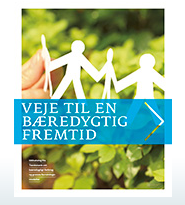 In 2011 The Danish Ministry of the Environment initiated a cross-sector think tank as part of the Cle-En 21 project (Clean Enterprises of the 21st Century). The focus of the think tank was on sustainable consumption and green business models. The purpose of the think tank was to look into some of the overall sustainability challenges we are facing, and to develop an idea catalogue with potential solutions as inspiration to companies, authorities and citizens in Denmark and the EU. Along with other experts, decision-makers and opinion-formers, Tania Ellis was invited to contribute to the think tank with fresh perspectives and concrete ideas as to how sustainable consumption and green business models can be promoted and supported on a national and international level. In January 2013 the results of the think tank’s work was presented at a launch event with Ida Auken, the Danish Minister of the Environment as key note speaker, who confirmed that many of the ideas will be brought to life over the coming years. Read more about the think tank project here and here.